From the country that proudly elected Donald Trump as its President comes another glowing example of the intelligence of its citizens. “Does chocolate milk come from brown cows?” is one of the most asked questions on the website of the Innovation Center for US Dairy. You may think there is some trickery here, or something that is hidden between the lines and does not meet the eye. But that’s certainly not the case. 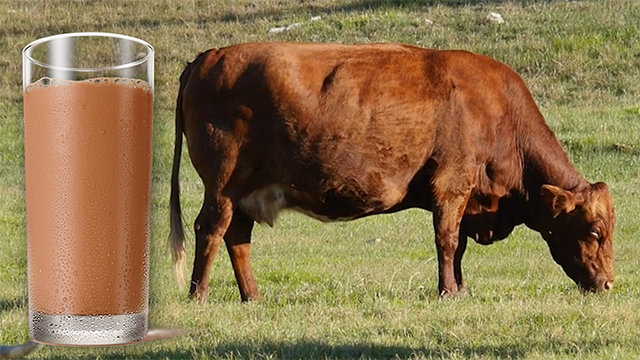 The answer is clear- chocolate milk is the same white milk that comes from cows with added sweeteners and flavours. Yet, the survey showed that 16.4 million Americans, who account for 7 percent of the population actually believe that chocolate milk,being brown in colour, comes from a brown cow. 48% of the people who responded to the survey admitted to being unsure of the origin of chocolate milk. This 48% is about 154,272,000 people, potentially all of them being voters, who aren’t sure that the answer to the question is definitely “cows”. This proves the widespread notion that the average American has a low IQ and is often misinformed or even uninformed about the things happening around them and in this case, even where their food originates from. On taking a look at the bigger picture, observers in education, nutrition and agriculture have noticed that Americans, for decades now, have been agriculturally illiterate. The average American is not aware of how their food is produced, stored or delivered to their plate. Similarly, study that the Department of Agriculture conducted in the early ‘90s, 1 in every 5 American adult did not know that hamburgers were made of beef. When 20% of a country does not know about one of their most popular foods, it makes for sorry reading. Cecily Upton, co-founder of FoodCorps, a non-profit organisation which aims to bring nutrition and agricultural education into elementary schools, is of the opinion that it is an issue of lack of exposure. People are used to go to stores to find food and hence the younger generation is increasingly becoming less aware of the origin and journey of the food before it reaches the store. In the modern world, indifference to knowledge about the origins of food products and a general air of ignorance surrounding the same has creeped into urban culture. Corporations have lengthened the journey of the food from a few kilometres to a thousand and more. You may know that chocolate milk is made from normal milk that comes from cows, but are you sure about the origin of each and every food in your diet? Conventional wisdom says you should be. This is not about chocolate milk, this is blatantly about how the Trump voters were “ill informed”. Leftist bias is in EVERYTHING. It is stated as common knowledge that Trump voters regret his election, when in fact MORE people have seen the value of his policies over the last few years. Good guy? No. Good at the task of presidency? Which does not include the task of being a “nice” and “charming” person, Yes. Action is what matters, his tweets do not change the fact of his successes.